The journey one of the first domestic workers’ groups in New York attests to the power of grassroots labor activism and the hurdles that come with it. Over the past decade, a group of workers has stepped slowly from New York City’s middle-class kitchens and living rooms into the forefront of the country’s labor rights movements. Domestic workers—the nannies, health aides, housekeepers and other household service workers—have organized, petitioned lawmakers, and championed Domestic Workers Bill of Rights legislation, which has been passed in four states so far. But the rise of the labor movement has come with some growing pains. The journey of Andolan, one of the first domestic workers’ groups to emerge in New York, attests to the power of grassroots labor activism, along with the hurdles that often crop up with each movement milestone. 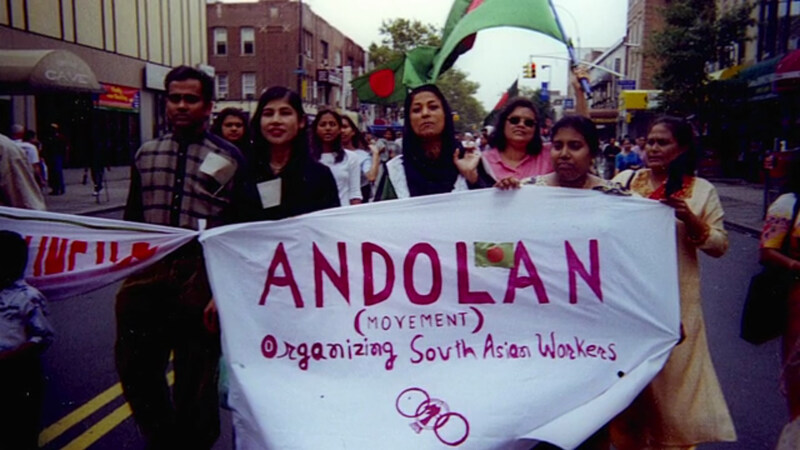 Andolan began organizing in Queens the late 1990s with just a handful of domestic workers from South Asia. They evolved into a fierce crop of community leaders who knew the vernacular of their ethnic communities as well as the language of political struggle. Departing from the traditional union model, they meshed social work with advocacy, helping women take legal action against abusive bosses, and connecting them to services ranging from counseling to self-defense classes. They made history with a lawsuit brought by an Indian worker against her former employer, claiming grueling work hours and massive wage theft, which led to a $94,000 settlement—an unprecedented sum for a domestic worker case, the group noted. Together with the local labor network Domestic Workers United, the group campaigned for stronger labor protections and shepherded the first-ever Domestic Workers Bill of Rights through Albany in 2010. In recent years, justice for household workers has become a hot cause, with campaign endorsements from Hollywood celebrities and official initiatives for global domestic worker protections through the International Labour Organization. A new documentary, Claiming Our Voice, traces Andolan members as they learn to grapple with their own history. Centered on a homemade theater production—a show developed by the women under the guidance of South Asian-American artist YaliniDream—the film, directed by Jennifer Pritheeva Samuel, follows the women as they seek self-expression beyond the simple survivor narrative. They reconstruct their stories as individuals and as a collective, with a pastiche of dialogue, song and dance, merging folk traditions with contemporary politics and radical performance art. As a kind of Pins and Needles for the South Asian diaspora, the performance is a seemingly simple act of storytelling—the women are essentially playing themselves. The dialogue and choreography depict memories of economic hardship in their homeland and after migration, facing exploitation and degradation as laborers, and marching together with fists in the air. Between the staged scenes, women speak in interviews about their fears and hopes on their own terms, outside the tight format of the media interviews and tragic testimonials that they were often asked to give. But there’s a bittersweet epilogue to the narrative. In 2010, about two years after they were applauded on stage, Andolan closed its office space and gave up its incorporated status, and after many years struggling as a staffed, funding-dependent nonprofit service agency, went back to being a volunteer-led organization. Andolan has continued to function in its pared-down form, but has shifted back to more intimate roots, with informal meetings and a focus on supporting individual members—not necessarily legal intakes or grant writing. This trajectory, which many successful nonprofits encounter at some point, touches on deeper questions about the sustainability of worker-based grassroots organizing over the long term, as long as they depend on fiscal sponsors subject to volatile government budgets and the whims of elite foundations. The worker centers of the so-called “alt labor” movement have reshaped the political landscape for marginalized sectors like day laborers and immigrant guestworkers. Representing highly segregated sectors, the groups have reenergized dialogue on immigration policy and racial and economic justice within mainstream organized-labor circles. Activists have developed creative tactics like viral media campaigns and community education programs to complement the standard activist arsenal of strikes and pickets. Yet paying the bills remains a challenge, particularly when your membership is poor, you don’t collect dues, and foundations and government agencies require complex application processes and extensive reporting of “deliverables.” The recession hit workers on both ends, too, gutting jobs and wages for individual workers and destabilizing the already tenuous financial bases of young community-based groups. One 2011 study found that nearly 90 percent of nonprofits were still impacted by the recession, struggling with depleted government and foundation funding streams. The bottom line that has bedeviled Andolan and so many other groups is the paradox of sustaining grassroots activism: the vitality of any movement is by nature fast-changing and spontaneous, while building a sustainable organization requires stability and the ability to plan for the long term, which the poor by definition tend to lack. Genuine low-wage worker advocacy is hard to do without dedicated volunteers who represent the workforce, yet no poor people’s movement can run on voluntarism alone. Still, Andolan has come farther than most. As the film rolls out the nonprofit’s legacy, Alam has been reflecting on the other groups inspired by Andolan’s organizing model (work is underway to create an archive to document the group’s history and accomplishments). Many young activists cut their teeth working with Andolan years ago and have since gone on to build established campaign groups like the National Domestic Workers Alliance. At the end of the day, Andolan won’t be remembered for how long they stuck around, but how they changed one of the most thankless jobs in the world into the vanguard of a new labor struggle. Claiming Our Voice is produced by Fine Grain Films, with Jennifer Pritheeva Samuel and Chitra Aiyar (disclosure: Aiyar is also a former member of the Asia Pacific Forum Collective, of which the author is a current member).